Thinking about my favorite things each week is causing me to be on the look out for things that make me happy. Picking these things out is becoming harder and harder. As I hit the pause button to intentionally take notice, there are more and more favorites I find in every day. As I picked out this week’s favorite things, I realized that this feature is less about stuff and more about experiencing the extraordinary in the ordinary. Today my job took me on a tour of the first Habitat for Humanity Restore in the U.S., which happens to have been selling building materials in Austin for years. I learned about this Handyman Soap that they’ll be selling. It’s pretty cool. You buy soap. You’re clean. Your purchase will help build homes. Awesome. After touring this facility I found myself being grateful that I get to work with people like this, doing good for others. They gave the soap telling me about how they benefit as an organization from it’s sale. I walked away feeling really grateful for my job and getting to do things like helping Habitat spread their message and asking myself, how can this be ‘work’? This week I was introduced to the gals of Grace and Lace, as seen on Shark Tank. One of the owners began sewing socks six years ago when she lost her new born. She’s quite an inspiration. Their products are on-trend and oh so cute. They’re a company with a mission to not only sell quality goods but to also make a difference in this world. Take a peek at the Grace and Lace boot cuffs, they even have the cutest lil’ ones for kids. A-DORABLE. I love their clothing line. I find inspiration just by visiting Holly’s site. I came across it from a blog I happened to be reading. What started as a simple paper goods studio has turned into a full mission dedicated to creating community and helping women see the beauty and blessings in every season. Here you will find products with purpose filled with hope and packaged with love. And it’s true. I ordered her new Bible study called In the Wait. I can’t wait to see what God does! When it arrived I opened the shipping envelope to find a well-sealed envelope with a handwritten “YAY”! 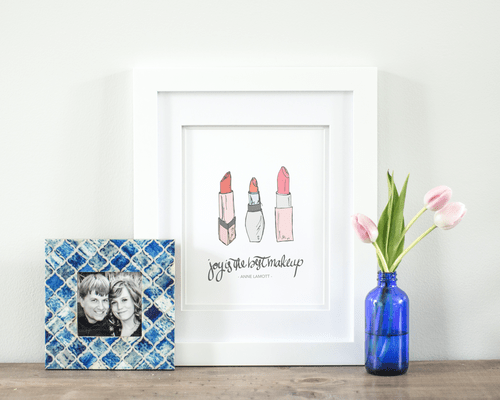 I love her print “Joy is the best makeup”! Isn’t that the truth. Tell me, what were some of your favorite things this week?